Collections under the goods and services tax (GST) rose by Rs 1,481 crore to Rs 92,150 crore in September against Rs 90,669 crore in the previous month. However, these were marginally lower by Rs 133 crore than Rs 92,283 crore in July. Little over 50 per cent of the assessees filed summary returns for September. Of eight million assessees, 4.29 million filed GSTR-3B. As many as 3.94 million had filed GSTR 3B by Friday, the deadline for September filing. To enable late filing, the authorities have waived late fee for August and September. For the first three months, the Centre and states collected around Rs 2.75 lakh crore, slightly more than the targeted tax collections of Rs 2.73 lakh crore. The target has been taken from the Union budget estimates for 2017-18, assuming 14 per cent growth in state revenue collections. The 14 per cent growth was taken, according to a formula of compensating loss-making states. This would give Rs 48,000 crore for the Centre collections and Rs 43,000 crore to the states or, in other words, Rs 91,000 crore for both in a month. Finance minister Arun Jaitley said, “The first three months is the transition phase and the pattern is yet to emerge. We are seeing Rs 93000-94000 crore monthly collections. That has been consistently maintained,” he added. Abhishek A Rastogi of Khaitan & Co. said these numbers would certainly increase in the months to come as the compliance level would improve further. Broader assessment of the collections reveals that cess collections were the highest in September in the first quarter (see chart). This could be due to an increase in cess in luxury cars and SUVs than any increase in sales. The IGST collections were also the highest in September. 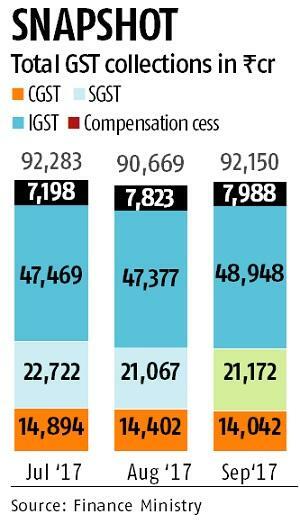 This is surprising since the IGST paid in earlier months could be used for payment in September. Of Rs 48,948 crore of the IGST, Rs 23,951 crore came from imports in September, also the highest in these three months. This is also a bit perplexing since imports rose 18 per cent in September against 21 per cent in August. The government has relaxed IGST rules from October, giving relief to mercantile exporters from paying the IGST. On the other hand, the CGST collections were the least in September in the first quarter, while the SGST mop-up was higher in September than August but lower than July. In view of the difficulties being faced during the return filing process and in order to further facilitate taxpayers, the authorities waived the late fee on filing of GSTR-3B for the months of August and September, 2017. The necessary software changes are being carried out in the IT system. Electronic cash ledger of the taxpayers who have already paid the late fee on filing of GSTR-3B either for the month of August or September, or those who pay such fee before the necessary changes are carried out in the IT system, will be credited with the amount of late fee so paid be them.